Confirmed on the Remote Desktop Services blog here. 1. Review the TerminalServices-Gateway operational event log on the Remote Desktop Gateway server and look for EventID 301 which states: The user “DOMAIN\user”, on client computer “1.2.3.4”, did not meet resource authorization policy requirements and was therefore not authorized to resource “172.17.50.10”. The following error occurred: “23002”. 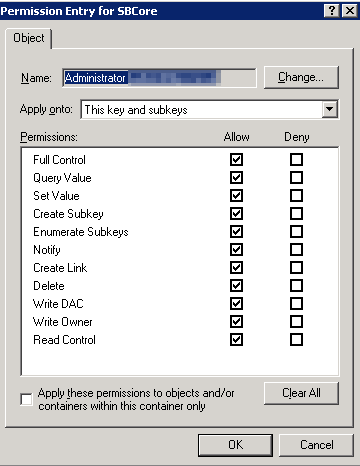 The resource IP should be one of your RDS servers, note healthy connections to the Gateway should (typically) specify the FQDN of the RDS server it is trying to connect to: The user “Domain\user”, on client computer “1.2.3.4”, met resource authorization policy requirements and was therefore authorized to connect to resource “RDS-NY-2.domain.co.uk“. You may find yourself in a position where 21 days isn’t enough to finish the migration, if you find yourself in this situation there are two methods for extending this limit. The methods below should only be used as a short term solution as they technically violate the EULA, but needs must. From the SBS 2003 server open a command prompt and run netdom query fsmo – confirm the SBS 2011 server is currently holding the FSMO roles. The procedure below gracefully transfers the FSMO roles back over to the SBS 2003 server. Run netdom query fsmo and confirm that the SBS 2003 server now holds all of the FSMO roles. The time limit has now been extended by 7 days. 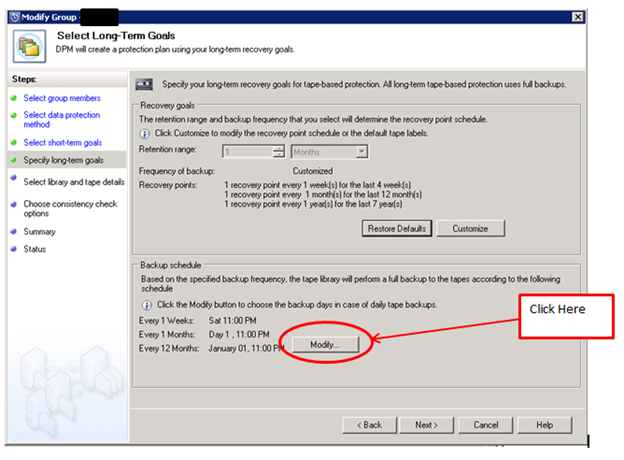 This method will prevent the source SBS 2003 server from shutting down indefinitely. 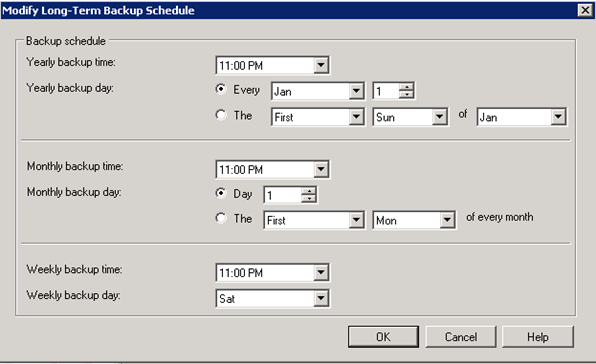 From the SBS 2003 server transfer the FSMO roles back to the SBS 2011 server. 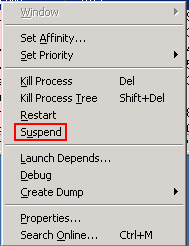 Find and right click sbscrexe.exe and choose suspend. Open regedit and browse to HKEY_LOCAL_MACHINE\SYSTEM\CurrentControlSet\Services\SBCore. 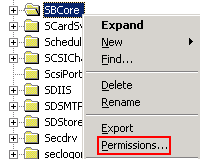 Right click on SBCore and select permission, add the administrator account and give full control to this key and subkeys, click yes if warned. In the right hand pane, change the “start” DWORD to 4 (from 2 default). Now browse to C:\Windows\System32 and locate sbscrexe.exe. 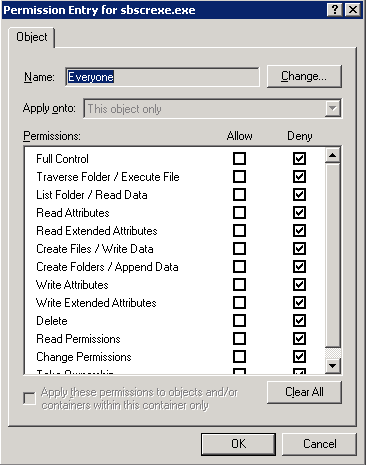 Right click, properties, security -> Add everyone and select deny for all. 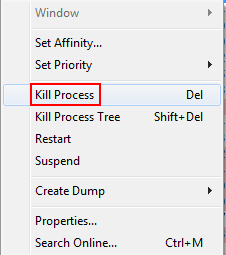 Go back to Process explorer and select kill process, open task manager and confirm sbscrexe.exe doesn’t restart. 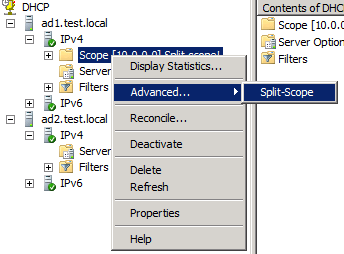 Split-scope is a quick and easy way to provide redundancy and load balancing for DHCP in your network. Server 2008 R2 introduces a handy wizard for creating a split-scope and saves some administrative effort, however it can only be used if both servers are running R2. Here are two ways in which you can utilize split scope. In this scenario, the 1st DHCP server will dish out all leases and the 2nd DHCP server should only be utilized if the 1st server fails. 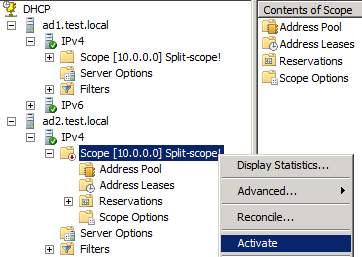 You can accomplish this with the “Delay in DHCP offer” setting when configuring split-scope (prior to to 2008 R2 you could use the “Conflict detection attempts” for the same effect). DHCP clients accept whichever server responds first to the DHCP DISCOVER packet, so we delay the response from the 2nd server which allows the 1st to respond and therefor serve the client. Now, as you’ve probably guessed the 80/20 is rather arbitrary, and can be shuffled around to suite your network. 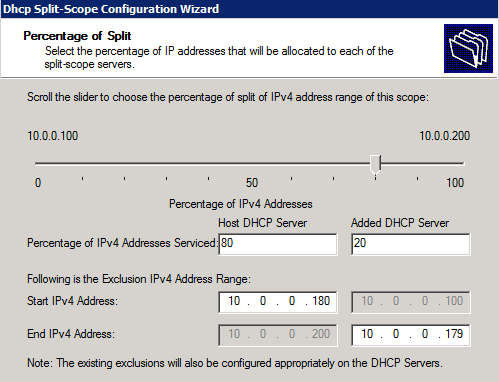 For this method you’d leave the “Delay in DHCP offer” equal when configuring split scope, which would give both servers a 50% chance of dishing out leases. You’ll probably want to set the scope to 50/50 and I’d make sure that each 50% could serve the majority if not all of the clients in your network. Here we will setup the 80/20 rule. In versions prior to Server 2008 R2, you would have to manually configure the scope on the 2nd server, the wizard included in R2 does this for you. At this point you should have 2 DHCP servers configured. The 1st server should have a scope with the full range of addresses, and the 2nd server should be scopeless. 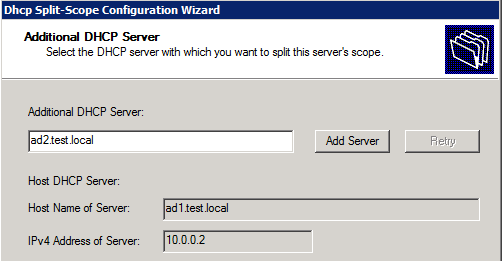 In this example I’ve configured the scope on AD1 for 10.0.0.100 – 10.0.0.200 and added both DHCP servers to the DHCP MMC console. In this video I will walk you through configuring the DHCP role and split scope. 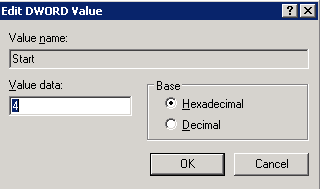 CTxAdmTools provide a handy tool for removing HP’s Proliant Support pack. I’ve used it on a number of occasions typically when P2V’ing HP servers, and it’s a great time saver. Once the server is virtualized you’ll want to remove the PSP as it may cause issues further down the line and it’s simply software and drivers that you won’t need on the system any more. I’ve seen people recommend removing the PSP prior to the P2V process, but I believe it’s best to keep the source server ‘as is’ if you need to backout of the procedure. Server 2008 introduced ‘Fine Grained Passwords’ (FGPP), which allows multiple password policies in a single domain. Prior to Server 2008 there was a limitation of one per domain. To achieve this you will need to create a PSO (password settings object) which applies at the user or security group level. There are 3rd party applications out there to for this, but personally I find using ADSI straight forward enough. The domain functional level needs to be 2008 or higher. You’ll be presented with a set of options which are explained below. 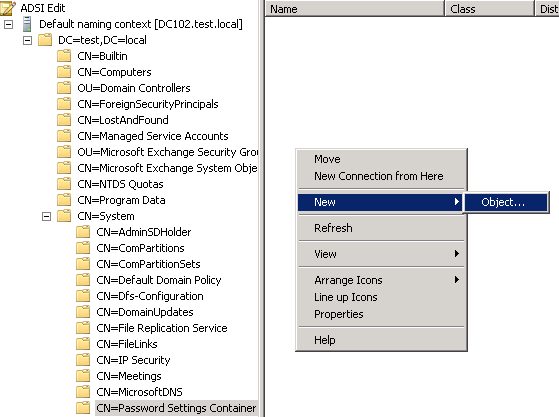 Get the DN (distinguished name) from ADUC (active directory users and computers). You will need to select advanced features in the view menu at the top. Double click on the group or user this PSO will apply to, select the attribute editor tab and find the distinguishedName attribute a small distance down. Copy and paste this into the edit attribute box in ADSI edit. Today we’ll look at setting up a quick PPTP VPN from Server 2008 R2 with 1 network card. You should be ready to connect! Server 2012 PPTP with 1 NIC guide now up.